Do you play great in practice but tense up, lose confidence, and make easy mistakes in games? Do you take players on in practice but play it safe in competition? Do you trust your skills in training but second-guess your decisions come game-time? Are you frustrated because you know you have the skill but are being held back lack of confidence in soccer? If you play with more confidence in practice than in games, you aren’t alone. Soccer players often report that in practice they are more relaxed and aren’t as worried about making mistakes. In contrast, they feel pressured to play perfectly and avoid mistakes in competition. Like Jason, you might play anxious and tense in games because you are distracted by what your parents, friends, and others on the sideline are thinking. Are you more accepting of mistakes in practice, but feel like there is more on the line in games? If so, you likely become frustrated after mistakes or play safe in order to avoid mistakes altogether. Becoming frustrated or playing safe will certainly hurt your performance. In practice, you know what your up against, but in competition you might spend more time comparing yourself and wondering if you measure up. 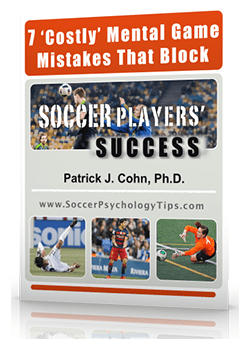 Focusing on the competition is one of the most common ways soccer player lose confidence. You may think your technique needs to be perfect in games so you overthink your passes, shots, and runs. Trying to play perfect soccer is a sure way to lose confidence. Do you want to win so badly that you are focusing on what the final result might be? If you are wondering if your team is going to win the game or not, you’re not focused on what will help you perform in the moment. Thinking about end results hurts confidence in soccer because it creates anxiety and pressure. If you under-perform in games, it’s likely that your mental game is holding you back. 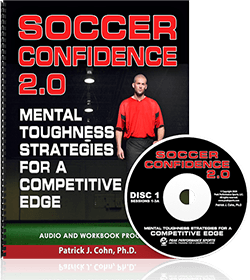 Mental training for soccer players is the fastest way to improve confidence, focus, and trust in your skills.